For two American astronauts flying in space, perhaps nothing reminds them of their Earthly ties more than tax day. As it turns out, being 220 miles (354 kilometers) above the planet is no excuse to file late. Thankfully, Cady Coleman and Ron Garan, who are currently living and working aboard the orbiting outpost, most likely took care of that already. "I'm not sure of their exact situations, but they could either file early, or if they have spouses, their spouses could file for them," NASA spokesperson Kylie Clem told SPACE.com. Coleman and Garan are two of six spaceflyers living aboard the space station. 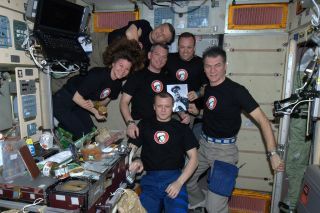 An Italian astronaut and three cosmonauts make up the remainder of the Expedition 27 crew. Coleman launched to the space station in December on a Russian Soyuz spacecraft. She is expected to return to Earth in September with crewmates Paolo Nespoli and Dmitry Kondratyev. Garan and cosmonauts Andrey Borisenko and Alexander Samokutyaev launched toward the station on April 4 from the Baikonur Cosmodrome in Kazakhstan. Taxes have been a regular part of human spaceflight since American astronauts began continuously living aboard the International Space Station in 2000. Today, space station crews have continuous access to support personnel on the ground, as well as Internet protocol phones and Internet access if they need tax advice. Astronauts can even post messages on Twitter, should they choose to complain about tax day (no one has, though). But 41 years ago, it was a different story for the astronauts on NASA's Apollo 13 mission to the moon. Many people probably remember the drama surrounding NASA's Apollo 13 mission in April 1970 – a spaceflight that has come to be known as the agency's most successful failure. An oxygen tank explosion during Apollo 13's voyage to the moon forced its crew – astronauts Jim Lovell, Fred Haise and Jack Swigert – to abandon their original objectives, while ground controllers scrambled to stage a rescue mission to bring the trio home safely. The Apollo 13 crew did make it back to Earth – the result of extraordinary teamwork and innovation. But, amid all that, Swigert also faced a bit of tax drama. Swigert was a late addition to the Apollo 13 crew, after command module pilot Ken Mattingly was sidelined due to his exposure to the German measles. NASA doctors worried that Mattingly would get sick during the flight, and he was forced to sit out on the historic flight. Since Swigert was a backup crewmember, he had not prepared to be in space when his taxes were due. "How do I apply for an extension?" Swigert asked Mission Control when flight controllers asked the Apollo 13 astronauts if they'd completed their taxes before launch. "Things happened real fast down there and I do need an extension."